What I got: The Super Tuck holster in black cowhide with optional J clips. For: Taurus PT1911AR, a full size 1911 with an integral Picatinny rail. Price: $69.75 ( +$15.00 for natural horsehide) $5.00 for the J clips. First impressions: Nice build quality. Four holes on either side to adjust the holster height and angle. Molded kydex scabbard to hold the gun. The scabbard is form fitting and recesses slightly into the trigger guard for retention. The instructions that come with the holster explain how to use a blow dryer to soften the kydex to adjust retention or one can send the holster back to Crossbreed for adjustment. One of the problems I had with finding a good holster was the rail on the Taurus 1911. The rail is wider than is typical on other railed 1911s and finding a holster that fit, between cheap “Uncle Mike’s” or “Gunmate” holsters and very high-end custom gunleather was quite difficult. A quick email to Taurus got a prompt response that they were aware of the issues with the Taurus and could provide a holster to fit. I tried several different positions with this holster and gun, from 1:00 to 5:00. For my body size and shape, carries in front tended to pinch when I bend. 3:00 was comfortable but the handgrip on the pistol jutted out and printed badly. Most people probably wouldn’t notice, but I did and really preferred better concealment. When I wore the holster in the 4-5 o’clock position, however, the situation changed dramatically. The holder was quite comfortable in that position. The gun was held flat against my back and didn’t protrude. Worn with a shirt untucked or tucked between the holster and the pants it didn’t print. In this early period when I was trying it out I did, however, encounter several problems. While the leather completely covers the space between my body and the pistol, the kydex only covers a portion of the gun. The slide and frame extend out from the front of it. As a result, the finish on the gun is subject to wear as one moves and the clothes rub against the pistol. Personally, I don’t consider this a downcheck. A carry firearm is not a show piece. If one is worried about wear or scratches, better to leave that gun in the safe and carry something a bit more utilitarian. Related to the coverage problem, I had a problem where the edge of the kydex would wear holes in my pants. This was definitely troublesome. Wearing out my pants in short order is not something I want a holster to do. While I certainly understand your concern, to be honest there have only been a handful of folks who have had this issue that I am aware of. The vast majority of our customers do not experience this and we have well over 40,000 holsters delivered to date. To be honest I suspect when this does occur it’s more of an issue with the individual user. Perhaps it’s the angle you carry your holster/gun at or more likely, how tight you wear your pants. I don’t know these as to be certain answers as I personally have never experienced this issue and know no one personally who has. As far as folks who have reported on this issue, it’s less than 6 or 7 that I can think of. Even if it were 10 or 20 folks, out of over 40,000 that is not enough to blame the design of the holster but rather a time to look at each individual situation for the cause. It is easy to think that if it happens to you it must surely be happening to everyone else, but such is definitely not the case. While that answer could be self-serving, I don’t think it is. To be honest, after the first few weeks of wear the problem went away. It could be that I had been wearing older pants that were really too tight (I’ve gained a few pounds over the years) and the new ones fit properly and therefore don’t rub so hard, or maybe their was a bur or something at the edge of the kydex that smoothed off with wear. In any case, I am not having the problem any more so while this is something to be aware of, I don’t think it’s any more than a break-in problem, at least not for me. I would remove the gun from the holster and find the that safety was off. On further investigation this turned out to be a training issue. When reaching back for the gun I was, without noticing it, brushing the ambi safety on the 1911. A simple change in how I reached for the gun corrected this problem. 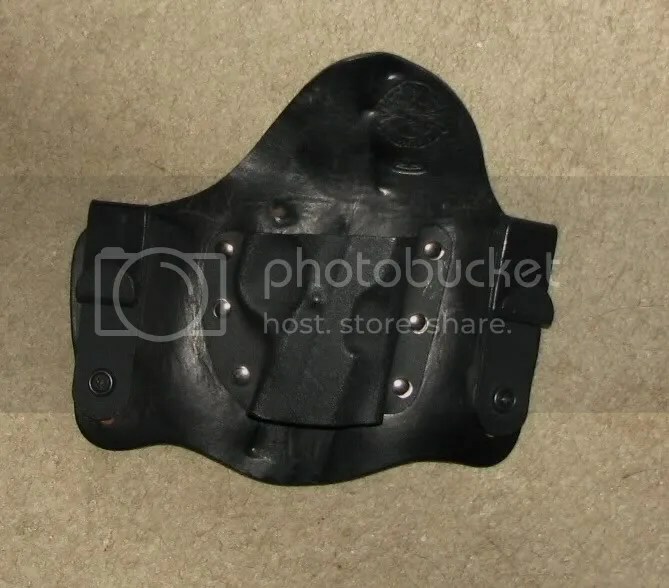 I suspect I would have had the same problem with any holster worn in the same spot unless it actually covered the safety. Sometimes on drawing the gun I would see that the magazine was not locked in place. This usually happened when I had been wearing the holstered gun in my car. This was certainly disconcerting and would have been unconscionable in a holster for defensive carry if it were not resolved. The clue to what was happening was that it happened when I was wearing the holster in my car. 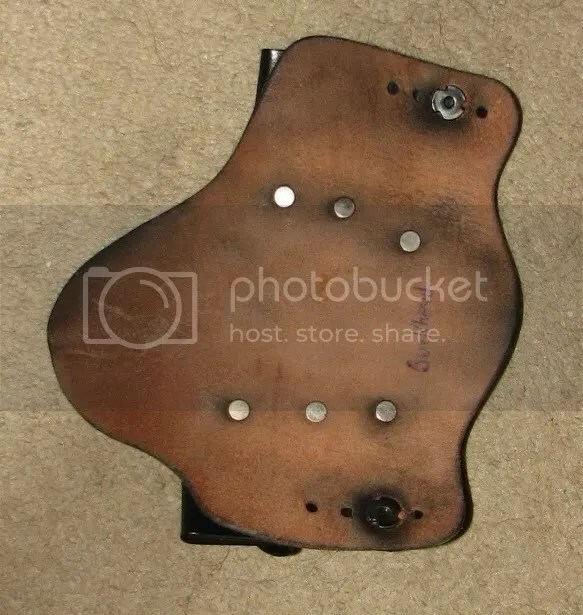 The gun and holster were pressed tight against my back in that position and apparently the pressure was enough to depress the magazine release. When I inspected the holster, I discovered that there was a small dent corresponding to the location of the magazine release. I continued to try the holster for a while and gradually, that problem went away. Still, I was experimenting with a holster and this problem was potentially serious enough that I would not be able to recommend it if it were left unresolved. This is a bit more common, we hear of this issue maybe 10% of the time and the solution is very simple. Instead of cutting a hole in the leather, just moisten the back of the holster in the area where the mag button hits. Do this in an area about the size of a quarter, then using your thumb or a blunt tool, form a divot in the front of the holster where the mag button hits. Once this dries it’ll hold it’s shape and prevent the mag button popping issue, this has not ever failed to cure the problem as far as I know. We don’t do this as standard practice because again, it’s not a common problem, however I might add this tip to the instructions we send out with our holsters. At a 10% occurrence rate, I would certainly recommend that they warn users about this particular problem and provide the correction instructions. And that’s really been it. The holster is comfortable, comfortable enough that I’ll generally use it when I’m Open Carrying as well as when I conceal–just tuck the shirt behind the holster rather than between it and the pants. It conceals well. Drawing is easy and is facilitated in that you can adjust the height and angle of the holster. Reholstering one-handed is easy, even in the rather awkward position that works best for me. It’s available at a modest price from a company with excellent customer service. Highly recommended. The lights in the corridor glowed dimly for the nighttime cycle and the air conditioning ran a little cooler. The air freshener smelled different as well. McIntire wondered if anyone else found these attempts to make the construction shack homelike annoying rather than soothing. “Go away.” The closed door muffled Petya’s voice. Petya stood a bare 160 cm tall and weighed maybe sixty kilos. His wore his solid black hair cut short. He looked almost like a doll next to McIntire’s 185 cm and 100 kilos. Pyotr Maktsutov–everyone called him Petya–one of the two junior engineers on McIntire’s team, was doing a co-op year on exchange from the University of Leningrad. McIntire did not know all the details of the deal but he knew that the contract to deliver materiel to Lunaville had some role in it. Part of the deal required Petya to receive actual experience in space. That meant that McIntire’s team had moved from Earth–getting their data by telemetry from the colony–to the construction shack. As Petya stood aside, McIntire stepped into the room. Petya had a room to himself as one of the benefits of the exchange program. Most of the other junior personnel had to share. “Please sit down,” Petya said. With both bunk beds folded against the wall, the compartment barely held enough room for the two chairs. An easel and a half-completed charcoal drawing occupied most of the remaining space. McIntire leaned close to the sketch. It showed O’Neill in a very early stage of construction. The moon hung in the background and the Rock, the large chunk of silicates connected to the construction shack by tether and around which the shack spun to give them the feeling of gravity, hung in the middle. The construction shack itself added balance in the foreground. “Careful,” Petya said as McIntire leaned closer. McIntire jerked back. He glanced over his shoulder at Petya. “I won’t,” McIntire said. He sat in one of the chairs. “You okay?” he asked. McIntire sat in silence a long time. Petya was a good kid. The insanity going on back on Earth did not change that. Finally, he said, “I’d like to keep you on my team. Charles agrees with me. That is, if you feel you can still work with us.” He looked up to catch Petya’s eye. “Good man.” McIntire rose to leave. “So what’s the extent of our damage?” Jared Arthurs asked. He had collected the C.A.M.P.E.R. research team in the common room, a combination kitchen, lounge, and game room. The entire crew crowded with him. The temperature had dropped since power had gone off and Jared pulled a jacket over his jumpsuit. “We’ve lost one of the solar collectors Crystal Gibson said. “The other has some power line damage so we’re still on batteries but I think it’s fixable. Jared nodded at Ralph Moulton. “So we abandon ship,” Michelle said. Jared gave a mental shake of the head that he very carefully kept away from his muscles. These people were not astronauts, they were machinists. A moment later he gave a half smile. Astronauts or not, they were handling this situation very well. Relief showed on each of the others’ faces. A job, something constructive to do, made them forget for a time their problems. I grew up to enjoy good food. For most of my life, however, living at the edge of poverty, if not flat out in poverty, has meant that the only way I could eat good food is if I cooked it myself using very basic ingredients. Now, money isn’t so much of a problem. Oh, I still can’t afford to eat out every day or anything like that but I don’t have to watch every penny when I shop for food and can get a little fancier with the ingredients. No, these days the problem is time. Who has time to do fancy cooking? Oh, that and the fact that I’m on a special diet (low carb . . . really low carb) because I’m diabetic and trying to treat mostly with diet. Two things help resolve this issue: my slow cooker and my oven. So here’s what I do. On the weekends (I still have a five day a week “day job” so weekends) I’ll roast up a pork loin. I’ll season it different ways to give me some variety–garlic one time; a “rib rub” another; sage, thyme, and oregano a third, and so on. That roast is my breakfast for the week. Every morning I carve of a slice or two and heat it up along with a bread substitute (low carb tortillas or flax-meal muffins), and I’m good to go. Next, I cook up an entree item in the slow cooker, a ragu or a stew or maybe a shredded meat. I’ve got a lot of recipes that I use for this. Once it’s cooled, I divide it up into zipper storage bags and freeze them. I’ll take one of these packages with me to work every day, add some frozen vegetables that I keep in the freezer at work, and heat up a nice, low carb lunch. By keeping a variety of vegetables I can mix them up to add a little variety to my lunches. Also, while I make the lunches in batches, by keeping several different things in the freezer at any given time I can have something different each time. For suppers, I pull out the stops. It can be a roast or it can be another one of those slow-cooker items. Keep this one in the refrigerator and I’m good for the week. The main thing is what to do with leftovers. By the end of the week the breakfast roast and whatever I have for supper is getting a bit old. However, I don’t let it go to waste. I wrap up leftover roast in aluminum foil and toss it into the deep freezer. In the event we ever get snowed in or some other emergency arises, well, there we are with some emergency food. Ragus, stews, and the like that I’d made for supper, I bag and they go into the set for lunches. And that’s how I keep myself fed with a variety of tasty foods without having to spend either a lot of money or a lot of time. If you like a sweeter bread you can add a bit of the sweetener of your choice, stevia and sucralose work well for this (provided you tolerate them well). Author thewriterinblackPosted on April 22, 2014 Categories Uncategorized1 Comment on Feeding the active writer. Larry Correia and others have, in the past, made allegations of bias in Hugo nominations. The award, in the end, is a popularity contest, but popularity among a generally small and self-selected group: people who buy Worldcon memberships (and not even all of them). And a heads up, it is time for Sad Puppies 2: Rainbow Puppy Lighthouse, The Huggening to begin. For those of you who weren’t readers last year, Sad Puppies 1 was my attempt to poke the humorless literati in the eye by getting MHN a Hugo nomination. When all was said and done, my entire slate for every other category got nominated except for me, and I missed the final 5 best novel noms by a handful of votes, with a final tally that would have put me in the top 3 any previous year. Which is quite the achievement, considering my regular reading audience isn’t exactly the WorldCon type. Note that this wasn’t just Larry asking his fans to vote for his work (as other authors have done in the past without any fuss) but other books they like too. Of those, I, personally, have read the novels, the graphic story and am familiar with Ms. Weisskopf’s work. And all of them I consider very much award worthy. Given that he’s batting 1000 in the ones for which I am familiar, I have no reason to think the rest are any less worthy. That makes the “slate” nothing more than a list of good works and editors for people to consider and maybe get behind. As it happens, the campaign was a success. Schlock Mercenary, it turned out, wasn’t eligible and neither was Marko Kloos. Of course, as soon as the results come out, so do the accusations of “cheating” and objections that these books made the ballot. And thus do the objectors prove, by their very objections, that Larry Correia was right all along. Richard Schneider commandeered the O’Neill construction shack cafeteria to hold a meeting of his own. To the meeting he called Julia Markham, John Millhouse, and two others: Keith Moreno and Rebecca Curie, respectively his information specialist and science advisor. When he released the news of what had happened back on Earth, Schneider expected at least some panic, but there had been none. He had not seen any sign that they were too shocked to even panic. Instead, his people waited for instruction in what to do. Schneider had never been prouder of the people working for him. Julia installed a large viewscreen in the cafeteria at Schneider’s request. It tied into both the computer system and video circuits. Currently, it displayed a view of the Rock around which the construction shack circled. Julia set her compad aside. “Those idiots back Earthside have finally done it. They’ve gone to war.” She reached for the viewscreen controls and paused, catching Schneider’s eye. At Schneider’s nod she tapped a switch. The starfield filling the viewscreen vanished to be replaced by a transcript of the broadcast they had received from A. C. Clarke less than an hour ago, the broadcast that had caused Schneider to call the meeting. Keith Moreno, a fifty-year-old polymath, leaned forward to answer the question. “The other stations are pretty much in the same fix we are,” he said. Although Moreno worked in the computer department, he did not set up networks. He explored networks to find information and do research. Rebecca Curie, a physicist by trade, placed a hand on Moreno’s arm. The ink had hardly dried on her doctorate and she did not have Moreno’s breadth of knowledge but her understanding of the physical sciences went much deeper. They worked together in a partnership that extended into their private lives as well. “What about the stations in low Earth orbit?” Schneider asked. Most of the government-owned stations, except the German’s and the Japanese’s, remained in LEO as did the privately owned station, C.A.M.P.E.R. Schneider winced. More than two hundred men and women…dead. He felt their loss more than he felt the loss of Denver. He had known some of those people personally. “What about communications Earthside?” he asked. Without waiting for an answer, he turned and hurried through the door. Millhouse intercepted him in the corridor. “What do you think, John?” Schneider asked. Schneider swore softly. So. He understood. Schneider had been driving himself in work to try and keep from thinking too much about his own children still on Earth. How much worse it had to be for Millhouse who had only just returned from his honeymoon when he had joined Schneider on this tour. Of course, his wife’s safety worried him. Millhouse jerked at Schneider’s rebuke then nodded. As Millhouse walked away, Schneider released the breath he had been holding. Schneider had not meant to snap at Millhouse like that. Still, his words had made Millhouse think about something other than his worry. Good. Schneider returned to his quarters. He did not see Marie. His oldest son, William, sat bent over the computer workstation. When did he grow up, Schneider wondered. One minute, Schneider was bouncing William on his knee and the next William was in graduate school, working on his PhD in mechanical engineering. “You could, huh?” Schneider said. William pivoted his chair to face him. “Best of luck to her.” Schneider forced a smile. While the coffee brewed at O’Neill tasted like mud in Schneider’s mouth, the cook resented any intrusion into his territory. “What are you willing to bet she has her way?” William asked. A thumping sounded at the door, low down as if someone were kicking it. Schneider placed fingers into the recessed door latch, pressed, and slid the door back into its pocket. Marie stood in the doorway, laden with a heavy tray. A round, glass, coffeepot sat near the center of the tray. Steam drifted from the fluid that filled the pot, carrying to Schneider’s nose the scent of better coffee than he had smelled, let alone tasted, since leaving Earth. On one side of the pot sat a pile of sandwiches, on the other, three bowls of soup. Schneider caught his breath and stared. Sixteen years they’d been married and he still could not get over how any room brightened when she walked into it. Other folk might think her rather plain, with her oval face and light-brown hair but when she smiled the world lit up. When his first wife had died, the need to care for his son had given him a reason for not dying. It had only been when Marie had come into his life that he found a reason for living. Schneider stepped to one side, bowed, and waved her inside with a sweeping gesture. “You don’t have to do that,” Schneider said as she began to set the table. “It makes me feel useful.” Marie turned to face him. “Considering where we are and what our situation is, well, no one is asking me to balance books or perform an audit. Besides, this will probably be our last good meal before you put strict rationing into effect so I wanted to grab it quick. “We have some problems,” Schneider said. As they ate lunch, Schneider told them both the details of the meeting. Saw Captain America: The Winter Soldier today. Bottom line: Awesome; see it. I had one bit of unpleasantness about it. The camerawork, particularly during the fight scenes was nerve wracking. My daughter or a bit said she didn’t want to watch it because it was making her motion sick. That said, the fight scenes were well choreographed and really captured what I imagined of Cap’s fighting style from the comics. The story started with blazing action and never let up. Don’t go in expecting deep, philosophical discussion but there is philosophy there. I do like the interpretation of The Falcon here. I hope they keep the character around in the Marvel Cinematic Universe. I was also very pleased by the Black Widow’s part in the movie. One of the things I liked about the comics, at least back when I was reading comics regularly (for various reasons I dropped out in the mid-late eighties) is that they kept Cap patriotic and idealistic without using him as a mouthpiece for partisan politics. Well, there was the occasional break in the latter part of that but the writers were only human. But Cap’s devotion to America, and the ideals of its founding (while recognizing the failings of the all-too-fallible humans that organized that founding) is one of the things that made him one of my favorite characters back in the day. And he remains so in the Marvel movies because they appear to be continuing that tradition. Really, very little negative to say about the move, just that bit about the camerawork. So, yeah, see it. I do wonder if “Agents of Shield was picked up for a second season (I haven’t seen most of it yet and reviews I’ve seen on it have been very mixed indeed) and, if so, well, the ending of the movie does present some challenges for that, let us say. It’s a Marvel movie, so watch for “easter eggs” at the end. There are two. Stay for both of them.